Reading is essential to becoming successful in life. 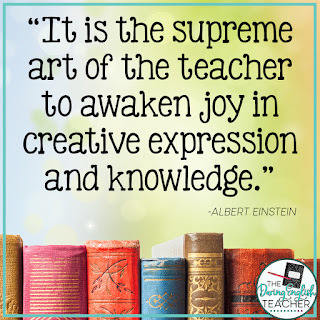 While some of your students may love reading and jump at the chance to read anything and everything, others are less enthused and will want to find ways around reading in your class. Here are ten different ways to get your students excited about reading in your classroom and beyond. 1. Find books that will be interesting for your students. Sometimes the most straightforward step is to bring books that are unfamiliar to your students but are in the genre of something they may love. Graphic novels or young adult fiction are usually great ways to get your students interested enough to read. Graphic novels will appear to be more comfortable for your students, but there are graphic novels that can be educational and fulfill the literary need for your classroom. Young adult novels are great for the high school classroom because if students are readers, they will most likely be reading books of this sort already. Young adult novels are focused on teenagers and the issues they deal with, so they are good options to read in your classroom. Try adding Persepolis by Marjane Satrapi or The Hate U Give by Angie Thomas to your collection as a starting point. 2. Ask for student recommendations. While you won’t be able to accommodate for each student’s preferences, giving students the chance to be recognized and to feel like their opinions matter is an excellent way for them to get excited about reading. 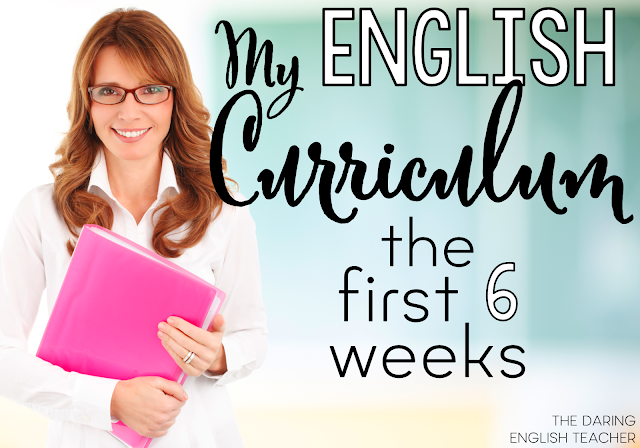 If you can use some of their opinions, and your schedule is flexible, definitely find ways to incorporate the different texts into your lessons. If a student loves fantasy books, for example, you could also suggest to him or her a list of the best fantasy books to connect with your students and find ways to get them excited about reading in general, even if the books in your classroom are not what they are interested in. 3. Read aloud in class. There are many positives to reading out loud to your class, one of them simply being that they will find themselves beginning to enjoy the time spent reading, even if they are not directly reading themselves. You can also emphasize the exact points you want them to pay attention to. Asking questions while reading out loud can also be beneficial in this process. 4. Give students time to read in class. You don’t have to let them read every day in class, but once a week or so, provide ten to fifteen minutes at the end or beginning of class to read a little, so that they can spend some productive time reading the books they may not feel like reading at home. Make sure to pay attention that students are reading, rather than working on other work so that this time can be helpful. 5. Ask students to send in questions. If a student has questions, he or she will not feel inclined to be excited to read the novels you assign. Ask the students to read the novel, and pose questions as they continue. You can use the questions as a further group discussion about the novel. Also, be sure to allow students to know others will have the same questions, so it is better to ask. They can ask questions about confusing aspects of the novel or what the characters mean when they engage in particular actions. Movies are often more accessible for students to understand and fully grasp the novels. This will also make them excited about the book, if they can watch the characters interact, after reading that particular chapter. Students are always excited for movie days, but you have to find the way to make not only the movie enjoyable, but the book as well, so try splitting up reading the novel and showing clips of the film as you continue reading the book. Ask students to note the differences between the novel and the movie to make sure they are actually reading and to also give insight into the endless argument of books versus movies. Students need to know that their opinions will be respected. By organizing a discussion on the book, with questions that will emphasize this, they will be excited to share and to learn more. You could ask questions like: why do you think this character made this decision? Was it the right decision? Why did you like or dislike this particular scene? What are the protagonist’s traits that you think work best or hinder him or her the most? This will get students talking and interested in the specifics that make the most sense to them. 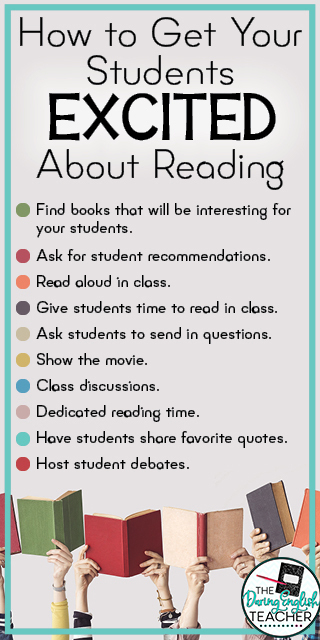 While just having days with a few minutes of reading can be helpful, a fun way to get students excited about reading is to set aside an entire class period to reading, if you can. You can always include activities that will help students as they continue reading on this one reading day, but this would both give them the inspiration to read and the time to do so, in case they are not able to otherwise. 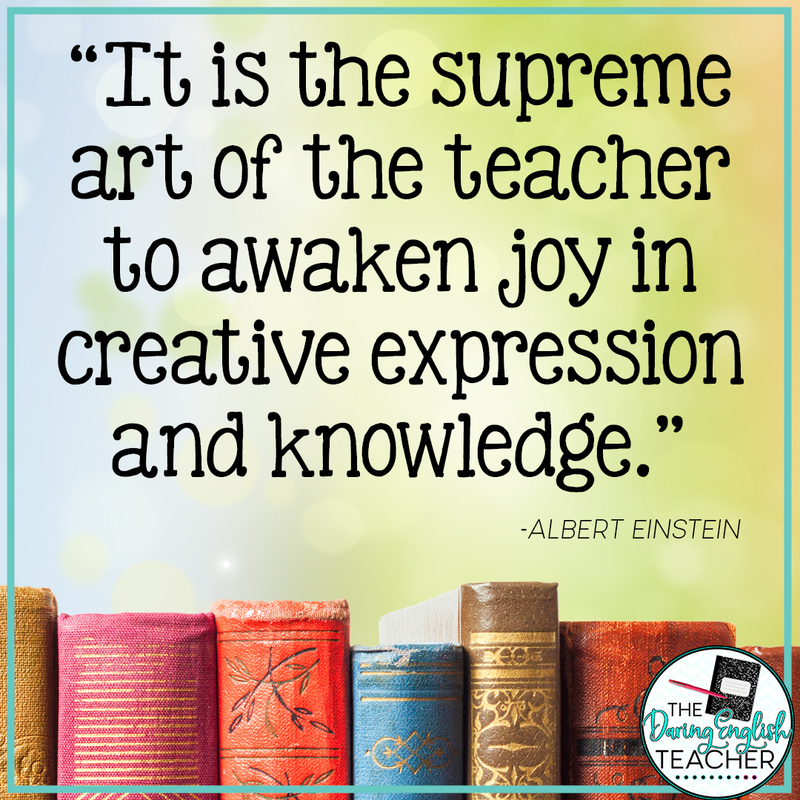 You can make the classroom cozy and be welcoming for this day to encourage the whole process. 9. Have students share favorite quotes. Quotes are always a good way for students to realize how much they enjoy the book or what they find important in a novel. It will also be interesting for the students to see the variations or the similarities between the quotes chosen by everyone. Finding quotes they relate to will allow students to understand that sometimes classic novels are just as relatable as young adult books. 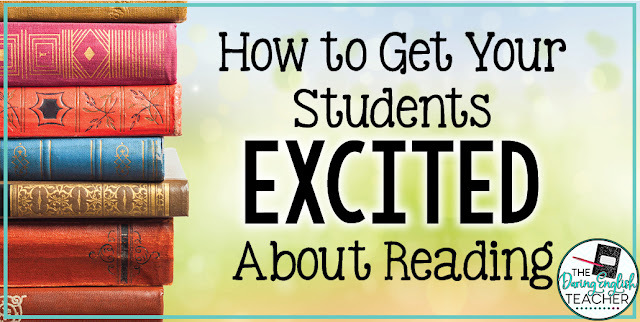 This can be a significant step in helping students get excited about the reading, even when it appears to be something they cannot feel like they would understand. When students feel like their opinions matter, they are more likely to participate and wish to engage with the book. This likelihood increases when they get to challenge their peers over their opinions. With a debate at the forefront of your classroom, students will be excited to participate and read. This will also increase group work in the classroom, which is an excellent way to create a comfortable environment in your classroom, and also get the kids involved who generally keep quiet. The debates could even be one half of the class against the other half to help students formulate opinions together, increasing their skills of working as a group.